A Taste of Science takes scientists out of the labs and to the people. TAMPA BAY – The idea sounds like the start of a joke: A scientist walks into a bar …. But the goal of Taste of Science is serious: Get scientists out of the labs and into the community to share their research in fun and informal settings. Those informal settings tend to be popular local hangouts that are open to having a scientist wax poetic about mud volcanoes, cancer, or whatever they’re studying at the moment. Science is important to everyone, organizers said, and events such as this help make that point. It’s an event that’s playing out across the U.S. as well as in the Tampa Bay area. Every year, local organizers hold a weeklong festival during which different scientists appear nightly at different bars or pubs. The festival, which ran April 23-28, included venues in Tampa and St. Petersburg and featured talks about volcanoes, earthquakes and health, among other issues. It’s not as dull as it might sound. Take the event’s Thursday (April 27) session at c.1949 in Tampa. 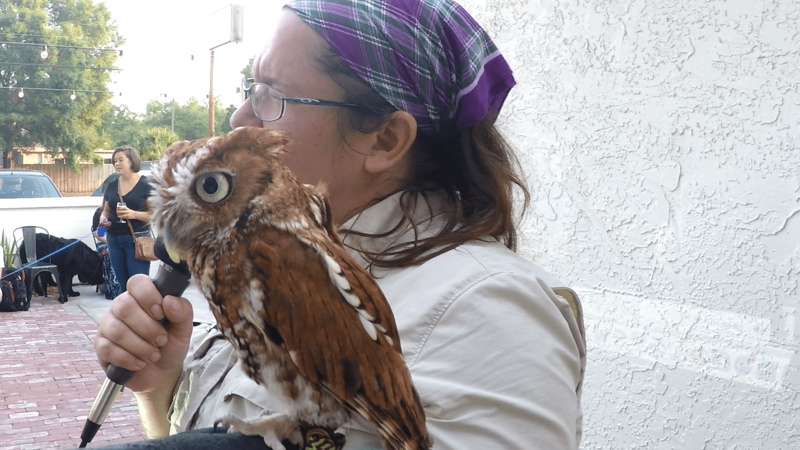 Mary Stanko, a bird expert from the city of Largo’s George C. McGough Nature Park – the Narrows, 11901 146th St N, brought birds to highlight her talk – Slasher the kestrel, G the hawk, and Lucy the screech owl. Slasher, G and Lucy were available to pose for selfies. The birds were followed by a discussion about work in the Marianas mountains, an underwater chain of mountains in the north Pacific Ocean where the volcanoes spew mud instead of lava. After that, an earthquake expert talked about his work in the Mojave Desert. The weeklong festival was a hit with Ingrid and Duncan James of Sarasota. They heard about the Taste of Science while taking part in the April 22 March for Science in St. Petersburg. They decided to try it and ended up driving daily from Sarasota to St. Petersburg and Tampa for each of the sessions. It’s important, Ingrid James said, especially with the current administration in Washington, DC, to show that science counts. Besides, she said, the information was fascinating. “You have to show the scientists you are interested and think their work is very important,” she said. For information about the Taste of Science, go to tasteofscience.org. To listen to some of the presentations, click below. Photos by Nick Reale, TB Reporter.